Here is a one of a kind t-shirt to start all your party conversations with. Forget that, it will spark many conversations where ever you wear it and you know that it will look great with your favorite blue jeans. Rick is a muscular and tattooed man holding a very large wrench indeed. He is here to help fix all your plumbing and rocket needs? With his handlebar moustache and his trucker “ATOMIC” hat, he is ready to take on that rocket ship in the background and get it up and running in no time. This t-shirt has many colors to choose from like dark red, purple and orange. The sizes range from Small to 3XL, so therefore everyone will be able to enjoy Rick just as much as the next guy. It is also a unisex t-shirt so you can enjoy it as much as the next gal as well. 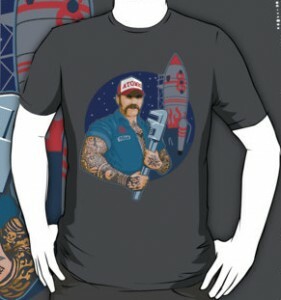 Get blown away with your new Atomic Rocket Nick T-Shirt.